"So much of it is autobiographical. Every story I tell is 100 percent true." The Josh & Gab Show has a memorable song called "Nine O'Clock Behind the Jack Rabbit": It's the story of a frightened kid at Kennywood Park who's nervously counting down the hours until he has to put on a brave face and meet a bully for an old-fashioned middle-school brawl. He's terrified, and admits it: "I'm not one for fighting, and I don't have a plan. Because I bruise really easily and I have tiny hands." The song, like most of The Josh & Gab Show, is a story pulled straight from the lives of the group's two members, comedian Gab Bonesso and songwriter Josh Verbanets. This particular one came from the childhood of a friend of Verbanets. "‘Nine o'clock behind the Jack Rabbit' was this famous phrase in my school," he explains, "because it basically meant, ‘I'm gonna beat you up.'" The song is anchored by a steady bass line and breaks out into a fiercely rockin' chorus in which Bonesso chimes in with growling vocals. In the end, though, it turns out that the bully is just as scared as the boy. The story continues: "We rode some rides together and didn't want to leave." 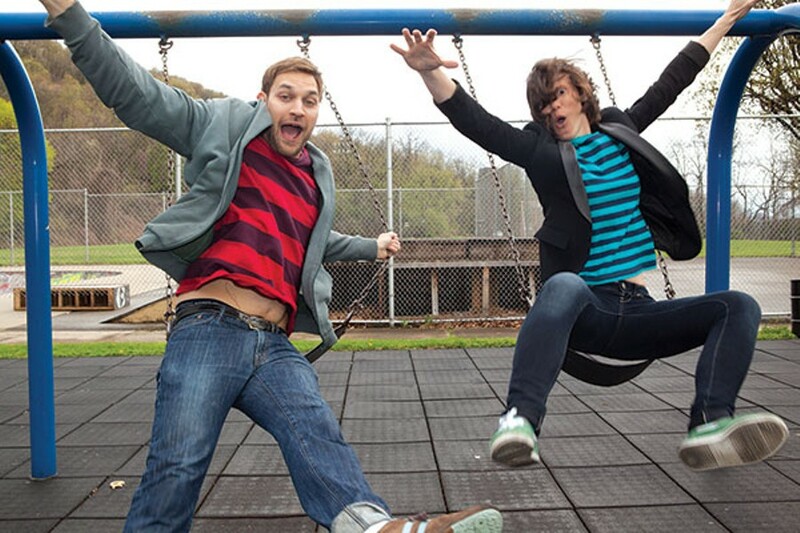 It's a very Pittsburgh example of how the duo's anti-bullying show — which utilizes music, comedy and interaction with children — provides a personal connection to children who are dealing with the issue of bullying. Josh Verbanets is best known around Pittsburgh for his frenetic performances as the frontman in energetic indie-rock trio Meeting of Important People. The band's poppy tracks and sometimes-silly lyrics have become a staple of the local scene over the past half-decade. 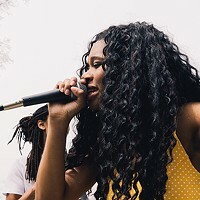 Bonesso, for her part, is perhaps best known for her over-the-top stage presence, and edgy standup that includes more adult-oriented subject matter, like criticism of the Catholic Church. That might make doing a children's show seem odd, but the fit has been perfect. The self-described "manic energy" she brings to the stage plays well to younger crowds. "I'm very cartoony when I'm telling the story," she says. "And I always make sure it ends with a punchline, because I am a comedian at the end of the day." Verbanets echoes the sentiment: "I've never seen a performer relate to an audience like Gab Bonesso." Much has been said in recent years about the pervasiveness of bullying via social media. In 2012, Consumer Reports estimated that 800,000 minors were subject to a form of bullying on Facebook alone. Children who are bullied have fewer and fewer places to hide from the criticism of their peers. According to Elizabeth Forward Middle School Principal Michael Routh, who's worked with Josh and Gab, bullying has become a "24-hour-a-day, seven-day-a-week thing." On the flip side, there's also been an outpouring of public support for those being bullied. From Lady Gaga's public statements on her troubles with bullies growing up, to the outpouring of support for LGBT youth through Dan Savage's It Gets Better Project, bullying has become an issue that is being confronted outright by public figures. Though bullying may be more widespread now, it's an issue that the public no longer shies away from. Verbanets and Bonesso began performing together from time to time a couple of years ago, Verbanets says, hopping in and taking part in each other's shows. "She would have a comedy show and she would ask me to come down and play a few acoustic songs to help warm the crowd up, or we would be doing a show and we would ask her to come, jump on stage, introduce the bands, and say something ridiculous into the microphone." While sharing the stage was fun, the two didn't really put together collaborative sketches until January 2012. After seeing a video of Joseph Gordon-Levitt and Zooey Deschanel performing a song about New Year's Eve, the two decided to satirize the two actors by dressing up like them and putting together a song in honor of ... Presidents Day. "Josh wrote this schmaltzy song about the assassination of Abraham Lincoln," Bonesso recalls. "I wrote it in probably 15 minutes," Verbanets says, "based on all the knowledge I could remember about Abe Lincoln, which was of course acutely factually wrong." The video didn't exactly go viral, but it was a big hit among friends. One, a teacher in the Montour School District, suggested that the two would be great at writing songs with a message for kids. Soon enough, the school district had commissioned them to write a 45-minute anti-bullying performance for Ingram and Burkett elementary schools. The duo immediately poured themselves into their work, incorporating research, songwriting and interactive comedy into the act. "We sat around her mother's dining-room table, scribbling on poster board and writing bits in notebooks," Verbanets says. "I wrote about six new songs in a week-and-a-half. Gab wrote all sorts of incredible comedy and interactive exercises." Though neither saw the act as a career catapult, they had an inkling that it might catch on. Then, quickly, they found themselves making The Josh & Gab Show a full-time commitment. "We did one show and next thing I knew, we were getting booked and people were calling and asking us if we could come [to their schools]," Bonesso says. The Josh & Gab Show has caught on with local schools, with numerous performances every month across Allegheny County and beyond. The program's popularity hinges on the show's highly personal nature. "So much of it is autobiographical," Bonesso notes. "Every story I tell is 100 percent true." For Verbanets, it was his artistic streak, along with good friends, that helped him get through his days of being bullied as a youth. "I was lucky to have a great group of creative friends around me," he says. "So any time I felt frightened as a kid, I always had someone to be in a movie I was making or help work on a song with me." The Josh & Gab Show has teamed up with the Children's Museum of Pittsburgh for a series of performances throughout the summer. 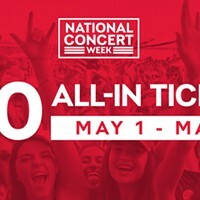 And on May 11, the duo celebrates the release of a collection of their original songs, I Am Not a Bully, through Music is Family, a New Jersey-based label that focuses on positive children's music. The album, produced by Jake Hanner of Donora, is a mix of personal stories about bullying and catchy tracks that utilize Josh's skills as a poppy indie rocker to avoid the mundaneness that sometimes plagues children's tunes. 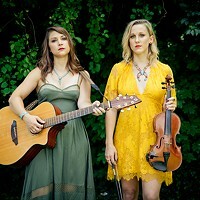 Elizabeth Forward's Routh, who brought the duo in to perform last August, agrees. He adds that Verbanets and Bonnesso's positivity, rare among anti-bullying programs, is also crucial to connecting with the kids. "The assemblies that we used to drag in here, they kind of had this dark overtone to them," he says. "Josh and Gab, they approach it differently. They share their own personal experiences, and I think that touched the kids in a way, and made sense to them." "Gab and I, we aren't very far removed from youth," says Verbanets. "We're both full-time performers and artists, so we kind of live slightly strange lives where we haven't really had to grow up." The result is a performance that emphasizes moving past the gloom-and-doom rhetoric that often surrounds bullying, and looking to creative outlets as a way of coping, whether it be music, comedy or anything else. Bonesso says that her goal is to "show these kids that no matter what horrible thing has happened to us, we were able to turn it into this really cool fun thing that everyone can enjoy, and that they're capable of doing it too, even if they're not artists."